Everybody arranges their own, and there's plenty of opportunity for everything. Various combinations available from individuals to groups up to 36. 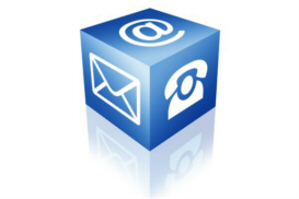 You can contact us by phone on 01286 870521. By post or by e-mail. 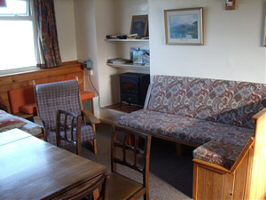 This is Snowdonia’s Original Bunkhouse, started by me in 1966, now an Independent Hostel, a base for your own activities. There are various grades of accommodation with helpful flexibility, and all you need is your own sleeping bag – and food, since it’s totally self-catering. Each section is equipped for cooking and dining. 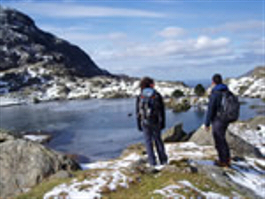 Our water comes from the Carneddau mountains -take some home in your poly bottle. It's warm and homely, and we usually become good friends with our customers. I keep it as a “ A Centre of Lo-Tech Pragmatism” . It reflects my attitude to life – keep it simple, so long as it works. Here it really does – come and see!